From 1998 to 2016, the CNO Strategic Studies Group (SSG) consistently recognized and accounted for the challenge of cross-domain maritime warfare, including the deep ocean. The Group generated several operational concepts that would give the Navy significant capabilities for the deep ocean part of the maritime battle. Within the body of SSG concepts were reasonably detailed descriptions of a range of unmanned underwater vehicles, undersea sensors, and undersea weapons such as the towed payload modules, extra-large UUVs, logistics packages, and bottom-moored weapons. All would use the seabed and undersea for sensing, attacking, and sustaining in support of maritime forces. One vehicle worth discussing is the armed UUV for single-sortie obstacle neutralization that would provide the Navy with the capability to counter armed UUVs, or conduct search for and clearance of fixed and mobile mines without the need for local air/surface superiority, or a manned support ship.1 It could plausibly do so at tactical sweep rates higher than today’s MCM forces. This can be achieved well before 2030, yet this capability is something neither the existing nor planned MCM forces can do. But, instead of focusing on the vehicles, there are two examples of operational-level concepts that exploit these vehicles and systems in recognition of the fact that the deep ocean is a critical yet misunderstood and underutilized part of maritime warfighting. In 1999, the SSG generated a concept called “Blitz MCM.”2 This work has stood the test of time technically and analytically, but has not been adopted by the Navy. And, while the SSG described it in terms of mine countermeasures, this same approach can be applied to deep ocean warfighting and the defense of undersea infrastructure. At its most basic level, Blitz MCM resulted from the recognition that sensor performance in the undersea was not going to improve significantly from a tactical perspective over the period of 2000-2030. For clarity, yes, the accuracy of various undersea sensors has improved routinely, providing accuracy down to fractions of a meter and able to produce fairly detailed pictures of objects. But the effective range of these sensors has not and will not dramatically increase, still being measured in hundreds and maybe a thousand yards at best. These short ranges preclude their use as a single sensor when it comes to tactical maneuver in the maritime environment. The SSG solution was to use large numbers of these individual sensors. In order to enable the rapid maneuver by maritime forces, the force must be able to conduct in-stride mine reconnaissance and clearance of approach routes and intended areas of operations. In order to avoid lengthy operational pauses to search large areas and neutralize mines or armed UUVs or undersea explosives, Blitz MCM uses relatively autonomous UUVs that rely on sensing technology only moderately advanced beyond that available to the fleet 20 years ago. However, unlike today’s operations where small numbers of mine-hunting vehicles and aircraft are involved, Blitz MCM relies on the deployment of large numbers of unmanned vehicles out ahead of the force to rapidly work through the areas of interest to find, tag, or clear threats. Hundreds of small UUVs can work together as an intelligent swarm to clear thousands of square miles of ocean per day. In some cases, based on the information provided by the vehicles, alternate approach routes or operating areas would be chosen, and the movements of closing units can be rapidly redirected accordingly. In other cases, the required paths will be cleared with a level of confidence that allows force elements to safely continue through to their intended operating areas. 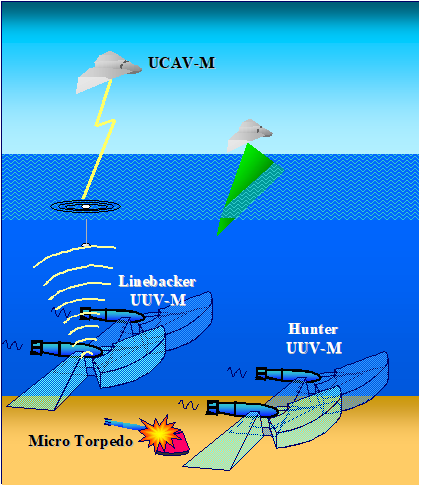 As illustrated in figure 7, UUV-Ms use conformal, wide-band active/passive sonar arrays, magnetic sensors, electric field sensors, blue-green active/passive lasers, and trace chemical “sniffing” capabilities to detect mines. Onboard automatic target recognition capabilities are essential to the classification and identification effort. Acoustic and laser communications to near-surface relays or seabed fiber-optic gateways maintain connectivity. Unmanned air vehicles are critical in their role as UUV carriers, especially when rapid deployment of UUVs is required across a large space. UCAV-Ms contribute to the effort with their mine-hunting lasers. They also serve as communications gateways from the “swimmer” UUVs to the network. The UUV-Ms will generally operate in notional minehunting groups of several dozen to over a hundred vehicles. Teams of vehicles will swim in line abreast formations or in echelons with overlapping fields of sonar coverage. Normally they will swim at about 8-10 knots approximately 50 feet above the bottom. Following in trail would be additional UUVs assigned a “linebacker” function to approach closely and examine any suspicious objects detected. 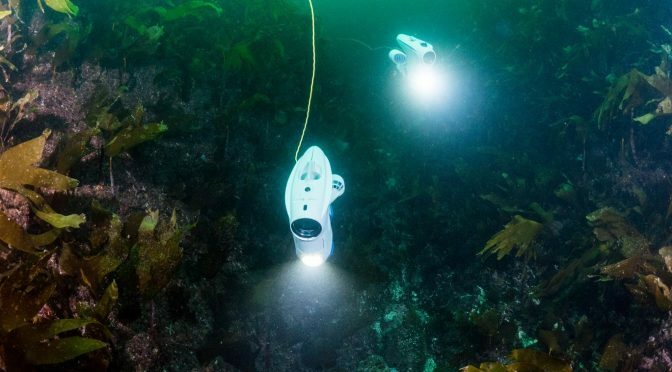 Tasking and team coordination will be conducted by the UUVs over acoustic or laser modems. Once a linebacker classifies and identifies a probable mine, its usual protocol will be to report the contact, standoff a short distance, and then send in a self-propelled mine clearing charge to destroy or neutralize the mine. Each UUV-M could carry approximately 16 of these micro-torpedoes. When one linebacker has exhausted its supply, it will automatically trade places with another UUV-M in the hunting team. Rapid neutralization of mine threats is key to the clearance effort. Today, this dangerous task is often performed by human divers. Blitz MCM uses a “leapfrog laydown” of UUV-Ms, as illustrated in Figure 8. Analogous to the manner that sonobuoys are employed in an area for ASW coverage, the force would saturate an area of interest with UUV-Ms to maximize minehunting and clearance capabilities. Once dropped into the water, the UUV-Ms quickly form into echelons and begin their hunting efforts. Navigation and communication nodes will be dropped along with the Hunter UUV-Ms.
Large delivery rates will be possible with multiple sorties of UCAV-Ms each dropping two to four UUV-Ms on a single load and then rapidly returning with more. Upon completion of their missions, the Hunter UUV-Ms will be recovered by UCAVs or USVs and returned to the appropriate platforms for refueling, servicing, and re-deployment. First order analysis indicates that with approximately 150 UUV-Ms in the water and a favorable oceanographic and bottom environment, reconnaissance and clearance rates of about 6,000 to 10,000 square miles per day (a 20-mile wide swath moving at 12-20 knots) should be achievable. This capability is several orders of magnitude over current MCM capabilities. As shown in Figure 9, afloat forces – CSGs, ESGs, SAGs, and submarines – do not have the capacity or the capabilities to establish permanent undersea dominance of the waters adjacent to the U.S. homeland and its territories (shown in yellow) and of key maritime choke points (shown with white circles), while simultaneously reacting to multiple crisis spots around the world (shown in red). The Navy must discard its current model of undersea dominance derived solely from mobile, forward deployed at-sea forces and replace it with one that is more inclusive − one that looks beyond just afloat forces. 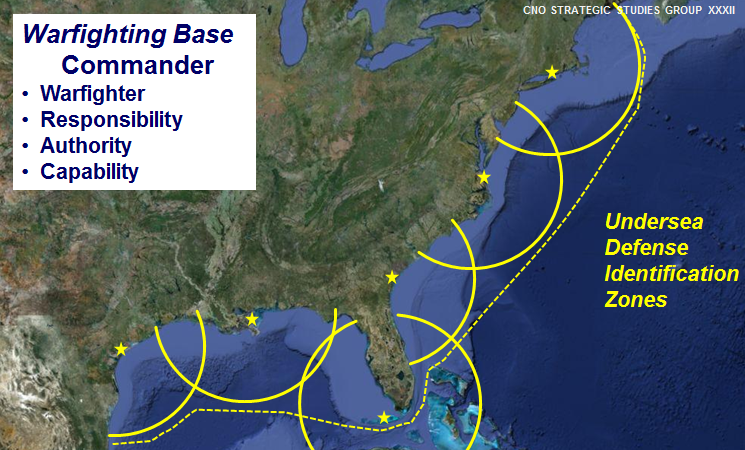 This new model must capitalize on the permanent access the Navy already has from shore-based installations at home and abroad (shown with yellow stars). Naval Warfighting Bases builds on detailed local understanding of the undersea, coupled with the projection of combat power from the land to control the sea; thereby providing permanent undersea dominance to defend undersea critical infrastructure near the homeland, protect major naval bases and ports of interest, and to control strategic chokepoints. Naval Warfighting Bases also provides the critical benefit of freeing up afloat Navy forces for missions only they can conduct. At home, the U.S. Navy could establish something called an Undersea Defense Identification Zone, akin to the Air Defense Identification Zone, to detect and classify all deep sea contacts prior to their entry into the U.S. exclusive economic zone (EEZ). By enhancing the capabilities of key coastal installations, the Navy will transform each into a Naval Warfighting Base. The base commander will be a warfighter with the responsibility, authority, and capability to establish and maintain permanent undersea superiority out to a nominal range of 300 nautical miles seaward from the base to include the majority of U.S. undersea and maritime critical infrastructure. Base commanders will have the capability to detect and track large numbers of contacts as small as wave-glider sized UUVs. Each Naval Warfighting Base will have a detachment of forces to actively patrol its sector. Naval Warfighting Base commanders will be able to maintain continuous undersea understanding, enabling control of the deep ocean. Naval Warfighting Base commanders will also have an integrated set of shore-based and mobile weapons systems with the capability to neutralize adversary undersea systems, such as UUVs, mines, and sensors. Naval Warfighting Base commanders will be capable of disabling or destroying all undersea threats in their sector, employing armed unmanned systems, and employing undersea warfare missiles fired from ashore. An undersea warfare missile is a tactical concept that combines a missile and a torpedo, similar to modern ASROC missiles. The missile portion would provide the range and speed of response, while the torpedo portion would provide the undersea killing power. Broadly integrating undersea warfare missiles into a variety of platforms would provide a tremendous capability to cover larger areas without having to tap manned aviation or surface assets for weapon delivery. These missiles would provide responsive, high volume, and lethal capabilities. And they could be fired from land installations, submarines, surface combatants, and aircraft. As practiced today, waterspace management (WSM) and prevention of mutual interference (PMI) result in a highly centralized authority, and extremely tight control and execution for undersea forces. This type of C2 would prevent undersea forces and Naval Warfighting Bases from becoming operational realities, and it would eliminate the warfighting capabilities from a balanced force of manned and unmanned systems. Undersea dominance is not possible without more deconflicted C2. The submarine force in particular must get over the fear of putting manned submarines in the same water as UUVs, and develop the related procedures and tactics to do so. In 2008 and again in 2013, Navy leadership offered that there is no requirement for the U.S. Navy to defend undersea infrastructure except for some very specific, small area locations.5 In this context, the term requirement is as it relates to formally approved DON missions, functions, tasks, budgeting and acquisition, but not actual warfighting necessity. The force must have the capabilities to sense, understand, and act in the deep ocean. The capabilities to do so are already available to anyone with a reasonable amount of money to buy them. Operationally speaking, hiding things on the seabed is fairly easy. On the other hand, finding things on the seabed is relatively difficult unless one is looking all the time, and has an accurate baseline from which to start the search and compare the results. 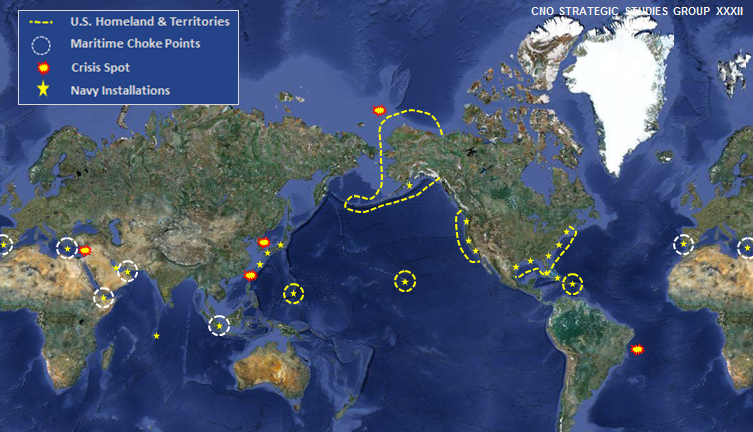 The deep ocean presents an “area” challenge and a “point” challenge simultaneously, and both must be addressed by the maritime force. Understanding the deep ocean and fighting within it is also a matter of numbers and time – requiring lots of vehicles, sensors, and time. The U. S. Navy is not currently in the game. With a variety of unmanned vehicles, sensors, and weapons coupled with Blitz MCM, Naval Warfighting Bases, and making undersea infrastructure defense a core U.S. Navy mission, the fleet can make the deep ocean – the entire undersea and seabed – a critical advantage in cross-domain warfighting at sea. Professor William G. Glenney, IV, is a researcher in the Institute for Future Warfare Studies at the U. S. Naval War College. The views presented here are personal and do not reflect official positions of the Naval War College, DON or DOD. 1. Chief of Naval Operations Strategic Studies Group XXXII Final Report, Own the Undersea (March 2014, Newport, RI), pp 4-6 to 4-9. 2. Chief of Naval Operations Strategic Studies Group XIX Final Report, Naval Power Forward (September 2000, Newport, RI), pp 6-8 to 6-12. 3. Chief of Naval Operations Strategic Studies Group XXXII Final Report, Own the Undersea (March 2014, Newport, RI), pp 2-15 to 2-20. 4. Chief of Naval Operations Strategic Studies Group XXVII Final Report Collaborate & Compel – Maritime Force Operations in the Interconnected Age (December 2008), pp 8-1 and 8-4. 5. Author’s personal notes from attendance at SSG XXVII briefings to the CNO on 19 July 2008 and SECNAV on 24 July 2008, and SSG XXXII briefing to the CNO on 25 July 2013.